Pregnancy is such a time of change. Unprecedented changes sweep across our inner and outer landscapes, from crashing waves of nausea, sickness and exhaustion to achy hips and backs, debilitating pelvic girdle pain and fear, anxiety and uncertainty about the birth and the wellbeing of our baby. And what makes this even more difficult is, firstly, we have to carry on with all our usual daily work and commitments despite all of these changes in our body and feelings, and secondly, there is so little we can control in this whole process. It is no wonder many of us find pregnancy, or at least aspects or periods of pregnancy, difficult. We begin my Pregnancy Yoga and Birth Preparation classes by closing our eyes, turning our focus within and tuning in to what we are experiencing through our minds, bodies and emotions. We then have the choice to share our experiences with the group. This time is precious, as it is a safe space to share feelings, fears and vulnerabilities with other women who understand, who will not judge and who are experiencing similar things themselves. This is such a vital part of the class, as it helps us to realise that we are not alone in how we are feeling, in what we are worrying about when we are awake at 3am and can’t get comfy and in our anxieties about our approaching labour. I then build the class practices to respond to what mums are experiencing that day. Yes there are lots of things to think about, worry about, plan and to prepare for in pregnancy, and we do explore these in detail through the classes; how our breathing makes a world of difference to anxiety, to stress and tension and how it is an unfailing support in labour, how postures can help ease aches and pains and encourage baby into a good position, and how relaxation is just wonderful on so many levels. Yet also what I try to do is create moments where mums can feel at peace, content, happy, connected with themselves and their babies, and enjoy and embrace their pregnancy. Yes pregnancy is a journey of preparation, often stressful and uncomfortable at times, yet so too is it a time where we can experience amazing, unique and moving moments of emotion, of tenderness, excitement, love and joy. I try to offer practices that give us a little break from the busyness and overwhelm of daily life, and offer us the chance to slow down, to enjoy and embrace the beautiful curve of our bellies, to imagine the beautiful, perfect face of our baby curled safe within our womb space and to rest in deep relaxation, sending love and unconditional acceptance to every part of our being, and every cell of our body. Whatever your experiences of pregnancy, and everything else you have to deal with in your life, give yourself permission to enjoy the experience. The discomfort and anxiety don’t need to be any less, but they can co-exist alongside sweeping waves of joy, excitement and anticipation of the wonderment of this amazing, perfect, tiny being growing day by day beneath your skin. My forthcoming book Milestones of Motherhood talks about these as milestones of contradiction; the simultaneous existence of difficult and uncomfortable feelings and bodily experiences alongside feelings of love, happiness and joy. As mothers we are expanding on all levels and we can hold all of these experiences simultaneously; one need not cancel out the other. So alongside whatever your pregnancy throws at you, try to build into your day the time and space to be, to love and to connect with your pregnancy journey. Doing so brings some counterbalance to the difficult parts, and these moments of daydreams, feeling our baby moving, from the first butterfly like flutters to the huge rib crunching kicks, can become some of our most treasured memories of mothering. Let yourself connect with your baby often, slow down, bring your hand to your belly, smile at the beautiful expanding curve and how amazing it is that your body is just doing all of this and your baby, a totally unique little person, is growing cell by cell, day by day. Let relaxation become an essential part of your daily schedule. The benefits are awesome for you and your baby, helping to lower stress hormones, release physical and mental tension, aid sleep, increase energy levels and help you prepare for labour. Make space for a few minutes listening to your breathing with your hand on your belly, lying down on your left side for a beautiful relaxation practice, imagining light, warmth or colours swirling through your body….you can find my free guided pregnancy breathing and relaxation practices here. In quiet moments of the day, share your feelings and thoughts with your baby, research shows they share our emotions and respond to our hormonal changes, so don’t feel silly, but enjoy this unique, special time where you can connect so intimately with your baby just through sharing your thoughts and feelings. Think about what you would like them to know and feel, and think to them just how loved and welcome they are; imagine how they must feel, received this love and welcome, what a beautiful experience for their first memories of life. Buy a beautiful journal and dedicate it to your baby and your pregnancy journey. Write letters to your baby, share your feelings, your dreams, your hopes and your fears, nurture yourself on your emotional landscapes and let your feelings, tears and full spectrum of emotions flow. This is so much more healthy than bottling things up and being ‘fine’. Nourish your body with fresh, health giving foods. Give yourself full permission to really enjoy your food, knowing you are nourishing yourself as well as your baby. Do what makes you feel good, swim, walk, connect with friends, make time to be with your partner in a way that feels comfortable and authentic. Take time in nature, in the woods and by the sea, breathing in the nourishing, pure air and know this is oxygenating your baby with every breath you take. 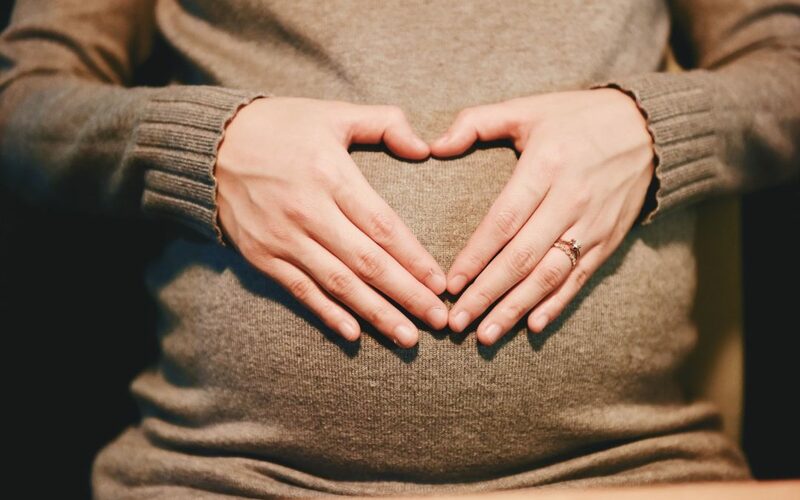 Take beautiful pregnancy photos of your growing bump, have some done professionally if this feels right for you, really embrace your beautiful, changing shape and try to see yourself as radiant, beautiful and so powerful in this time. Connect with these new, emerging elements of yourself and let yourself feel excited about the journey to come. Think about how you would like your baby to be born, without getting caught up in the worries and what ifs, and spend some time each day just visualising this gentle, beautiful birth, really focusing on the part where you bring your beautiful baby up to your chest and touch, feel and hold her for the first time. Let yourself enjoy this. Practice the Love to Me Love to You relaxation, where on the inhale you say Love to Me, and imagine feelings of unconditional love and acceptance flowing to every cell of your body. And on your exhale, saying Love to You and sending this powerful love to your baby, imagining your love enfolding your baby. Take the pressure off yourself to be perfect. Take pregnancy as a journey of learning to love yourself that little bit more as you are learning to love your baby. I’d love to hear how you connect with your baby and find ways of enjoying pregnancy alongside the challenges; it is so worth it and you absolutely deserve it. My forthcoming book Milestones of Motherhood explores how mothering is a journey of change and transformation for women as we learn to love and care for our children and will be available from Mother’s Milk Books shortly.